(Nanowerk News) A study published by researchers at the RIKEN Advanced Science Institute (ASI) has shed first-ever light on a class of heterometallic molecular structures whose unique features point the way to breakthroughs in the development of lightweight fuel cell technology. The structures contain a previously-unexplored combination of rare-earth and d-transition metals ideally suited to the compact storage of hydrogen. The most abundant element in the universe, hydrogen holds great promise as a source of clean, renewable energy, producing nothing but water as a byproduct and thus avoiding the environmental dangers associated with existing mainstream energy sources. Broad adoption of hydrogen, however, has stalled because in its natural gaseous state, the element simply takes up too much space to store and transport efficiently. Figure 1: Reversible hydrogen addition and release of heterometallic polyhydride clusters (top). The structure changes of the hydride clusters resemble the up-down movement of the pantagraph of a train (bottom). One way to solve this problem is to use metal hydrides, metallic compounds that incorporate hydrogen atoms, as a storage medium for hydrogen. In this technique, the metal hydrides bind to hydrogen to produce a solid one thousand times or more smaller than the original hydrogen gas. The hydrogen can then later be released from the solid by heating it to a given temperature. 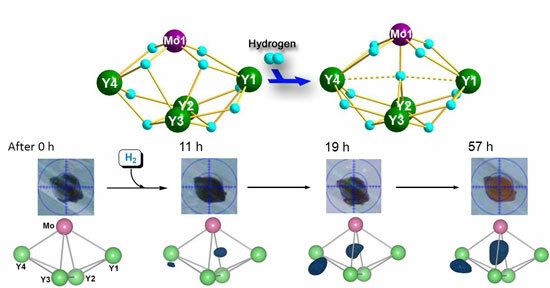 The new heterometallic hydride clusters synthesized by the RIKEN researchers use rare-earth and d-transition metals as building blocks and exploit the advantages of both. Rare earth metal hydrides remove one major obstacle by enabling analysis using X-ray diffraction, a technique which is infeasible for most other metal hydrides - offering unique insights into underlying reaction processes involved. 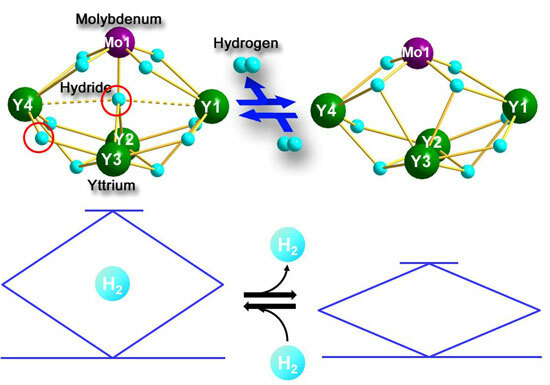 Rare earth metal hydrides on their own, however, do not undergo reversible hydrogen addition and release, the cornerstone of hydrogen storage. This becomes possible through the addition of a d-transition metal, in this case tungsten (W) or molybdenum (Mo). Figure 2: Addition of hydrogen to a metal hydride cluster with retention of the single crystal morphology. Top: A schematic representation of the hydrogen addition reaction. Middle: Photographs of the crystal at different reaction times. The crystal color changed from black to red as the reaction proceeded. Bottom: Differential electron density maps showing the appearance and electron density increase of the two new hydride ligands (blue) as the hydrogenation reaction proceeded. While rare-earth / d-transition metal-type metallic hydride complexes have been studied in the past, the current research is the first to explore complexes with multiple rare earth atoms of the form Ln4MHn and with well-defined structures (Ln = a rare-earth metal such as yttrium, M = a d-transition metal, either tungsten or molybdenum, and H = hydrogen). In a paper in Nature Chemistry ("Molecular heterometallic hydride clusters composed of rare-earth and d-transition metals"), the researchers show that these complexes exhibit unique reactivity properties, pointing the way to new hydrogen storage techniques and promising environmentally-friendly solutions to today's pressing energy needs.